Generally, All Purpose Flour is considered not good for health because of metabolic slowdown, acid-alkaline imbalance etc. 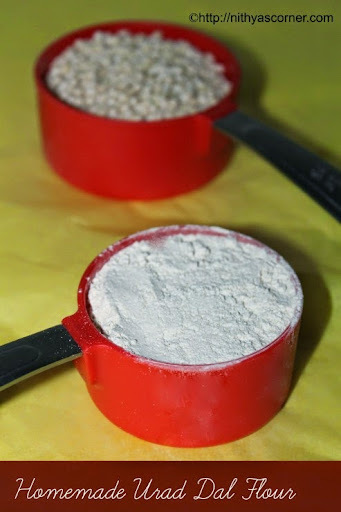 When I was looking for an alternate flour that can be used in place of All Purpose Flour, I found this recipe. I tried using this Gluten-Free All Purpose Flour to bake cakes, muffins, pancake etc. It came out very well, and I was not able to make out the difference at all. The baked goods tasted great. Not only bakes, I also tried making chips. It came out very well. I will only use this gluten-free flour in place of the General All Purpose Flour in my recipes. Combine all ingredients. Blend with a whisk and store it in a dry container. Use this flour when any recipe calls for All Purpose Flour. Now, Gluten-Free All Purpose Flour is ready! Happy (healthy) Baking! useful for people with gluten intolerance or wheat sensitivity. 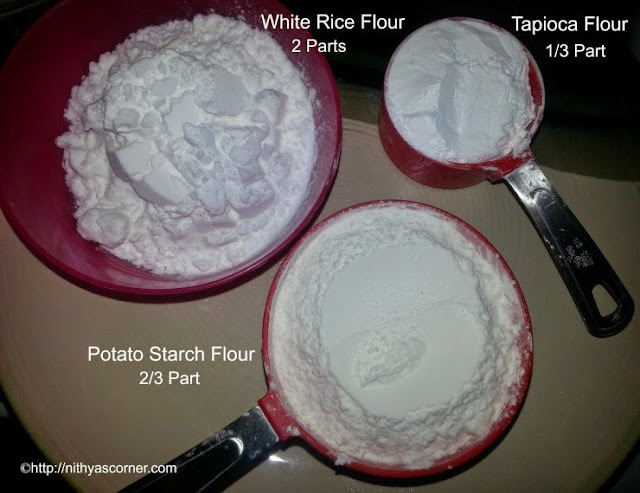 This entry was posted in How to and tagged All Purpose Flour, Potato Starch Flour, Purpose Flour, Rice flour, Tapioca Flour on November 22, 2014 by vikashbhardwaz. 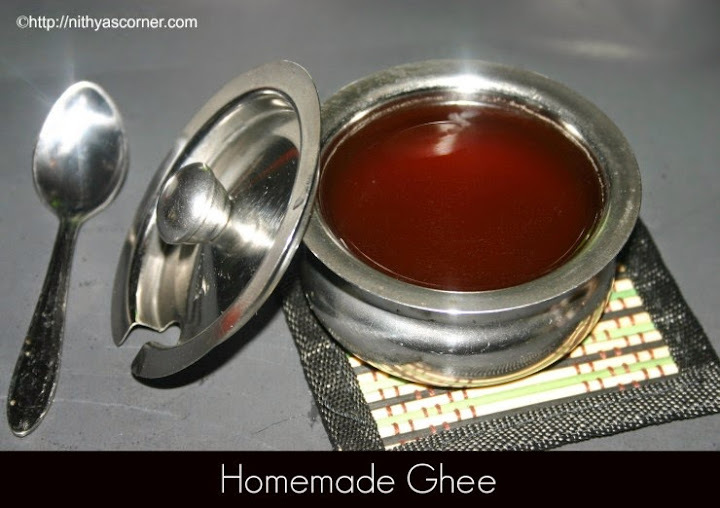 Aromatic and delicious homemade ghee! Once in a month, I would make ghee at home. When my husband’s comes home, he will ask me “Nithi, is it a ghee day?” When I make ghee, my house will have the aroma of ghee. Moreover, I add curry leaves to the ghee and it would enhance the flavor more. I like ghee with the flavor of curry leaves but Sanvi doesn’t. She will simply avoid it so these days, I make ghee without using curry leaves. I feel making ghee is the most easiest work in the kitchen. Whenever I have festivals ahead, I make ghee in batches and use the homemade ghee to make sweets and savories. I am not a big fan of store bought ghee. I like the homemade ghee better. For those who buy store ghee, please try making ghee once at home and I am sure you’ll love it. a. Home made ghee tastes better and smells good. b. 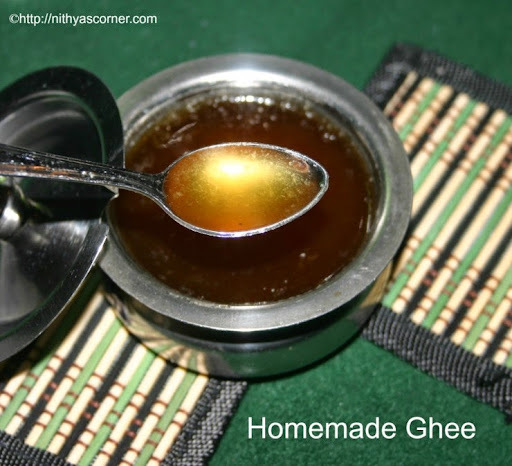 Home made ghee is much cheaper than the store bought ghee. Yield. 1 pound of butter = about 1 1/2 cups clarified butter or ghee. 1. If you have kept the butter in the freezer, take it out and let it be in room temperature for atleast half-an-hour. In a clean medium sized heavy bottomed pan, place the butter sticks and cook the butter in low-medium heat. Do not heat the pan before adding the butter sticks as the butter would burn before melting and the taste of the ghee may not be as desired. Throughout the process, do not cover the pan with a lid as the water content in the butter needs to evaporate. Keep boiling the butter and at one stage, the butter will melt down completely. 2. Now the butter will boil with a sound. Once the sound ceases, you can see a scum of creamish white color or foamy bubbles (milk solids combined water globules) will be formed at the top. 3. Now the white scum or frothy bubbles will turn to a large number of frothy little bubbles. As the water content evaporates, a clear yellow layer with little bit of white bubbles will be visible. This means the butter has been clarified. We are almost done. 4. Within very few minutes, the scum will become golden brown in color. Now, add a pinch of rock salt or two sprigs of curry leaves or drumstick leaves and switch off the stove. The rock salt will help the residue settle down. Curry or drumstick leaves will add flavor to the ghee. Some would also add a drop of curd or buttermilk. I always add curry leaves. You are in the final stage of cooking the ghee so be very careful to not burn the solids or brown sediment that is formed at the bottom of the pan. Burnt solids will ruin the aroma and flavor of the ghee. 5. Let the ghee cool for 20 minutes. 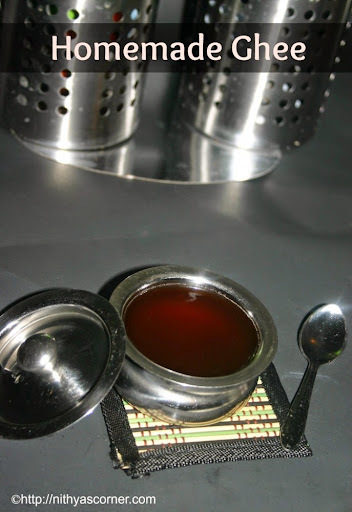 Now, filter the ghee using a fine strainer or muslin cloth into a clean dry glass jar without the residue. Cover with an airtight lid. While handling, be careful not to use a wet spoon as it would spoil the ghee. Now, Homemade Ghee is ready! 1. Without refrigeration, ghee can be stored in an airtight container for six months. 2. With refrigeration, ghee can stay fresh for 1 year. 3. At room temperature, ghee becomes solid. 4. 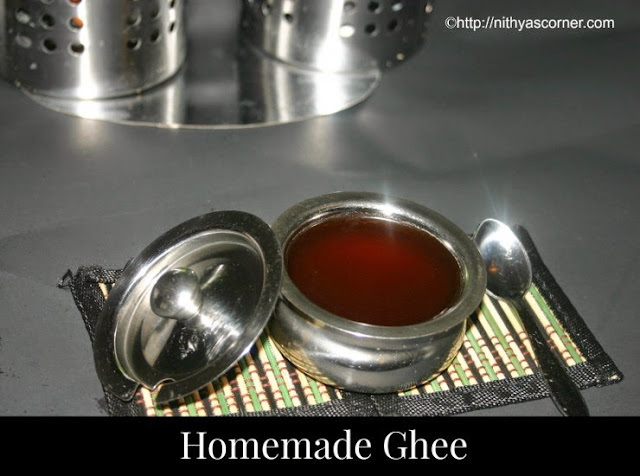 Use a dry and clean container and spoon to store the ghee. Do not let even a drop of water get into the container as it may promote bacteria and spoil the ghee. 1. If you have made butter at home, then keep it in refrigerator for a day. 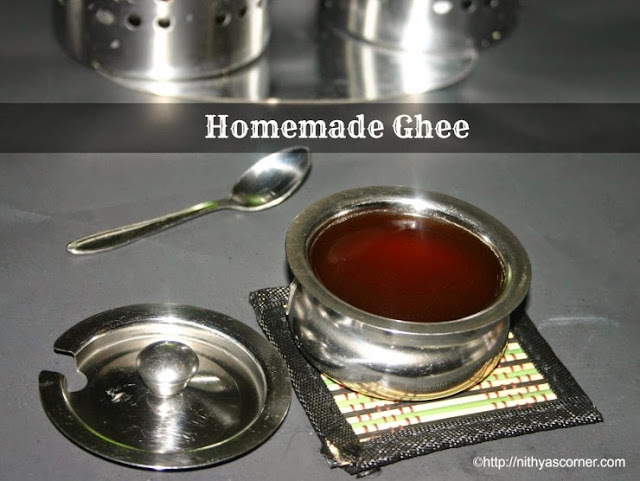 If you make ghee without refrigerating, it will yield lesser ghee. 2. Salted butter will foam a lot when it is boiled. Use a large pan to accommodate the foam. If you stir it continuously, the foam will subside. 3. Ghee’s taste depends highly on the butter used. If you use good butter, the ghee will taste good. Do not use cheap butter. 4. Ghee requires your observation and patience so concentrate on the ghee. Do not fasten the process. Cooking ghee is a slow process. 5. Use a medium sized pan to make ghee. If you use a small pan, then the butter will cook slowly. If you use a very big pan, then the ghee would be easily burnt. 6. You can add rock salt or curry leaves or drumstick leaves during the cooking process. It will give a good flavor. 1. What to do if I have only salted butter? Do not worry! You can still go ahead and make ghee. It would not taste salty. 2. What to do if my pan could not hold the froth? When the froth overflows, stir it continuously. This will being the froth down. If not, take the pan out off the heat for few seconds and stir. After the froth has come down, you can continue the process. 3. Can I use butter which has extra ingredients in it like vitamins, emulsifiers and minerals? Or can I use a any other butter that serves a different purpose like spreadable butter? I would not recommend such butter as it would not come out well or the way we need it. This entry was posted in How to and tagged Curry Leaves, Ghee on November 22, 2014 by vikashbhardwaz. Ice cubes – 8 nos. (optional). I did not use it. Cheesecloth or a clean kitchen towel or white veshti. I have used cheesecloth. In a heavy bottomed pan, set the milk up to boil over medium heat. Stir occasionally and make sure not to burn the milk. Once the milk starts curdling, you will see a light yellowish whey along with the curdled milk. If the milk has curdled completely, stop adding curd (lemon juice or vinegar). Remove from the heat when the separation of the curds and yellowish whey is complete. Now, turn off the heat, add the ice cubes (optional) and remove the curdled milk from stove. Let it sit aside for 10-15 minutes. Do not stir it. Note. If you add more lemon juice or vinegar, the cheese will be sour. Place the muslin cloth over a colander or strainer. The muslin cloth should be large enough to collect and wrap the whey. Rest the colander over a large vessel. Now, strain the curdled milk through a clean muslin cloth. Then, hold it under running water for a minute so that the smell and sourness of the curdling agent (curd/lemon/ vinegar) goes away and also prevents the cheese getting stiff. Now, gather the corners of the muslin cloth into a bundle and squeeze out the excess water as much as you can. Hang the muslin cloth either in your kitchen cabinet or cabinet knob or the kitchen sink tap. Leave it as such for about 2 hours, and the excess whey will drain completely. If you want to cut the paneer into cubes, place it under a heavy object for 1 hour. Before you cut paneer, refrigerate it for at least 30 minutes (optional). The cheese will be firmer and easier to handle. Then, cut the paneer into cubes and store it in an airtight container. To make sweets, paneer can be refrigerated for 1 to 2 days. Paneer can be refrigerated for 2-3 days or kept frozen for months. Do not expose paneer balls to air for a long period. It will dry out. What to do with the Whey? Whey is healthy. You can use the whey to split the milk again for Rasgulla. You can make a bread dough with the whey in place of water. You can use whey to cook vegetables. Paneer softness depends largely on the milk’s fat content. Substitute the whey in any baking recipe that calls for water. Freeze the whey for future use. Put the whey in ice cubes trays or small cups and pop it out for later use. The cloth should be tight enough to wrap the paneer well otherwise paneer will lose its shape and the sides will be crumbly. Color of the paneer depends on the milk we use. Make sure you use a cloth that drains the whey water well. I use muslin cloth. Paneer Recipes. Paneer Based gravy and also Paneer recipes listed under “Paneer Category” in the Home Page. This entry was posted in How to on November 22, 2014 by vikashbhardwaz. I consider July to Jan as festival months because we have festivals to celebrate every now and then. I usually grind the urad dal flour and store it. Whenever I need to use them, I grab my urad dal flour. It is super easy to make and definitely much better than the store bought flour. 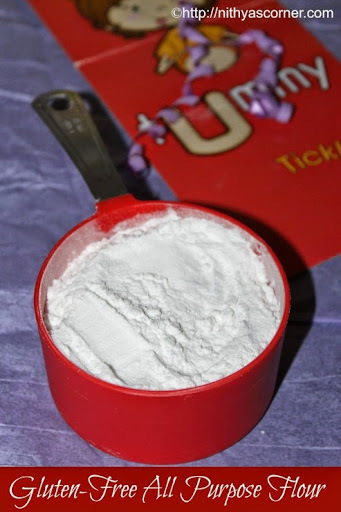 If you are planning to make lot of snacks like murukku, thattai, seedai etc., make a large container of urad dal flour and use it when required. 1. In a heavy-bottomed pan, dry roast the urad dal on a low flame till light golden brown and nice aroma comes. Switch off the flame and cool it down. 2. Transfer the roasted urad dal to a blender and grind it smoothly to a fine powder. Sieve the powder. 3. 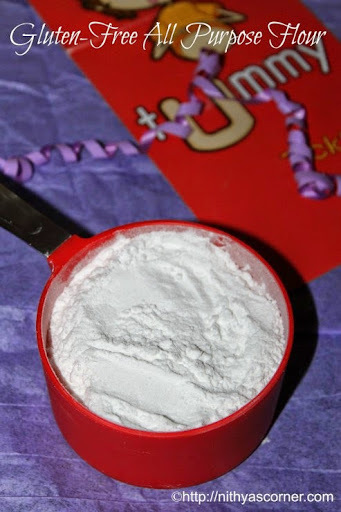 Collect the fine powder and when it cools down completely, store it in an airtight container. You can add the coarse powder to the next batch you grind. Make sure you sieve it again. Now Urad Dal Flour is ready! Make sure the lentils are stone and debris free. When you grind the urad dal, grind it in intervals such that your blender does not get heated. When you grind the urad dal, it should be completely dry. Avoid using urad dal that are lumpy and discolored. 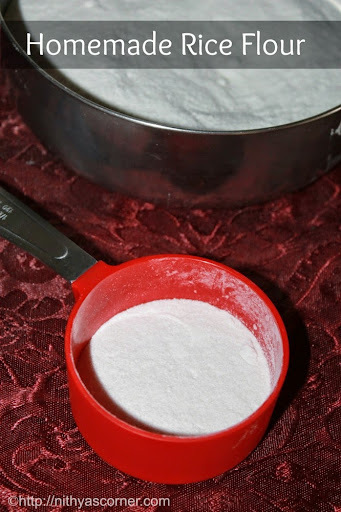 Homemade Rice Flour is used for making snacks and savouries. Rice flour can also make certain dishes crispier and also acts as a thickening agent for certain dishes. I always have them in my pantry. 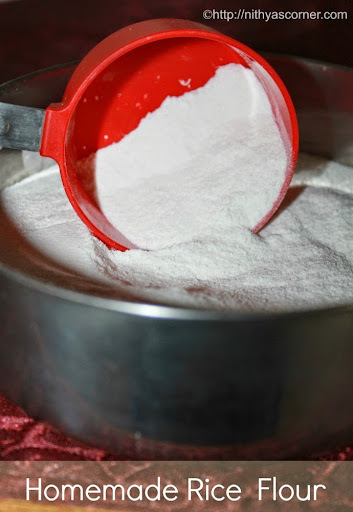 Rice flour are quite easy to make at home. 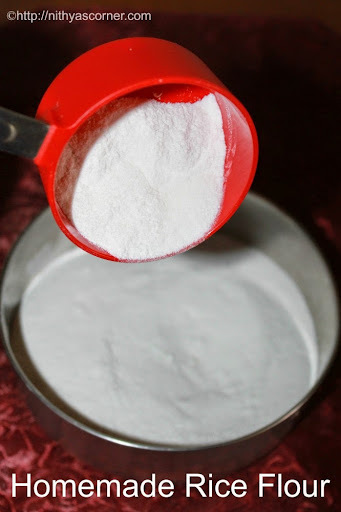 I make Rice Flour at home during the festive season and use it throughout the year. 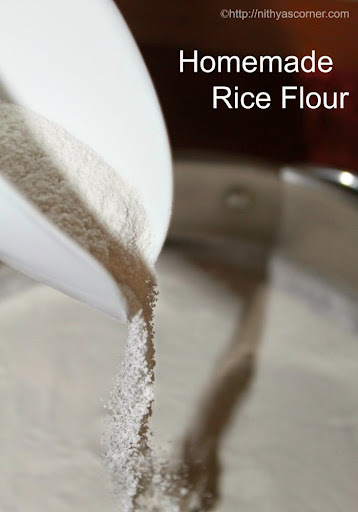 Buying a good quality rice flour from store is much easier than the homemade rice flour. At the same time, it would give me immense satisfaction and pleasure to make snacks using homemade rice flour. 1. Pick, clean, and rinse the raw rice thrice. Soak it in water at least for 1 hour. Drain the water completely. Spread a cotton cloth and transfer the soaked rice to the cloth. Spread the rice well on the cloth. Let the rice dry out for about an hour.The rice should be slightly moist. 2. The rice would be brittle and crisp. Transfer the rice to the blender. Grind the rice until it is super fine powder. It will take about 3 minutes. 3. Add the rice powder to the fine sieve and sift it to get a super fine rice flour. When you sieve, you will have get slight rava like mixture. Transfer them to blender and grind them along with your next batch of rice and then sieve them again. 4. In a wide bottomed pan, dry roast the sieved rice flour until you see steaming coming out of it. Then spread it in a newspaper or a large vessel. Let it completely cool down. Once it cools down, transfer the rice to an airtight container. Now the rice flour is ready! If the quantity of the rice exceeds more than a kg, then better grind it in the flour mill. The drying time of the rice depends on the climate and quantity of rice. 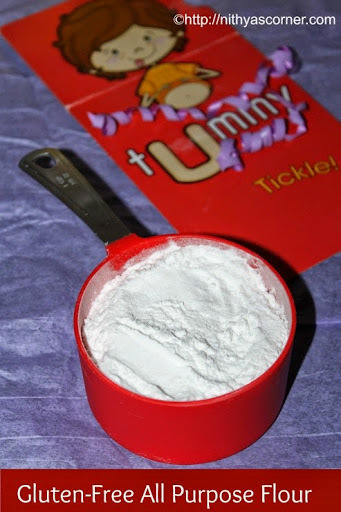 This entry was posted in How to and tagged Rice flour on November 22, 2014 by vikashbhardwaz. I learned to make curd three months after my wedding. Gj is a great fan of curd. If he is eating curd, then he needs to have some spicy side dish like Potato Fry, Prawn Curry etc. Once he eats his favorite combination of curd rice and spicy side dish, he will go to a deep sleep. Whenever I need to get some work done by him, I will not make Curd Rice. When I was doing my masters here, Curd Rice used to be a very good option for me. Whenever I was loaded with assignments, I would simple make Curd Rice and a spicy curry. I am done…Gj also never complains because Curd Rice is his one of the top favorite food. Just three days after our wedding, my mom-in-law asked me if I knew the techniques of making curd. I thought curd is like a Sambar Recipe where it involves lot of preparation and cooking. Believe me…I was totally new to cooking then. I did not know even the basics of cooking. I was asking her the ingredients and the process of cooking curd. She was taken aback. She then explained me the whole procedure. I felt so embarrassed. My mom makes very good curd. I learned the art of making curd from her. My mom’s curd never falls out even if you turn the bowl upside down. Yes. It is true. You can see the pictures below where I have tilted the bowl and the curd does not fall out. My friends knew my mom’s technique, and urged me to write the procedure and tips for making the “Non Fall Yoghurt”. If you have any questions, please email me. So here goes the procedure…. 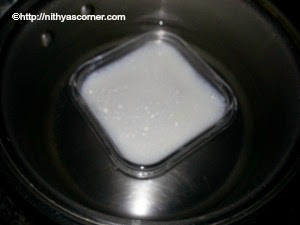 You can make curd/yoghurt using microwave oven and stove-top method. I have written the procedure for both the methods. You can choose whichever method is comfortable for you. Boil a cup of milk for 15 minutes in a microwave container. If you think the milk will overflow, stop the oven at 7th minute and after a minute, reheat the milk for the remaining time. At the end of the 15th minute, you would see cream formed as a layer on top of the milk. If you want, you could remove the cream or else leave it as such. I have removed the cream in this method. Wait until the milk temperature comes down to lukewarm (It should be warm not hot. Just immerse your finger and you should be able to bear the heat for 15 seconds). Move on to Step 2. Boil 2 cups of milk for about 10 minutes under medium flame. Reduce the flame for a minute at the time when the milk tries to overflow. Then again boil the milk well. You will see a layer of cream formed on the milk. If you want you can remove the cream. It is your choice. At this time, switch off the stove. Let the milk come down to lukewarm temperature. It should be warm not hot. Our Grandmother’s Method. Just immerse your finger onto the milk and you should be able to bear the heat for 15 seconds. Modern Method. Approximately 115 degrees F on a candy thermometer. Now, take a clean container and add 1.5 teaspoons of curd. Once you add the curd, pour the boiled milk on to the curd container and vice versa. Pour the milk three to four times vigorously. This makes the curd blend with the milk uniformly. The better they are mixed, the quicker and better the curd will set. Now finally pour the milk to the container in which you are going to set the curd. Then close the container with an airtight lid and leave it undisturbed in a warm and cozy place. Usually, I keep it inside my oven. After 5 to 6 hours, the curd will be set. If you live in a cold place or your curd is taking longer time to form, then fill a vessel with hot water and place the curd container on it. Keep the curd container closed (as shown in the below picture). How To Check if Your Curd/Yoghurt Is Perfect? When you shake, tilt, or even place the Curd/Yoghurt bowl on its sides or even almost upside down, the curd should not come out. The curd should be quite firm. Now, the fresh curd/yoghurt is ready! Refrigerate the curd. Generally, whole milk will yield a thick curd. I use 2% milk still I get thick curd. If you are using 1% milk, then your curd will be little watery. Homogenized milk needs more quantity of curd than the regular milk. 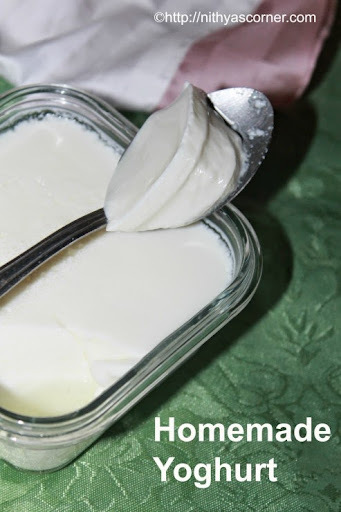 Say for a cup of homogenized milk, you need to add 2 tablespoon of curd. Milk should not be very hot when you add the curd. 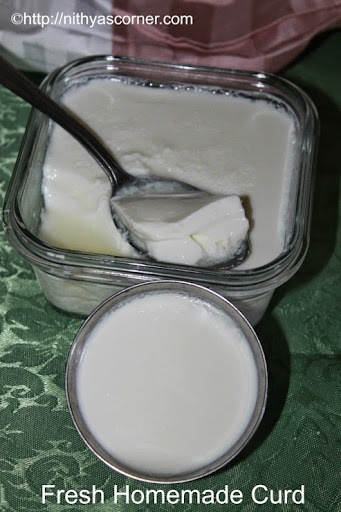 The heat will kill the bacteria in curd, and your curd will not set properly. Milk should not be cold when you add curd. The curd will not set at all. Milk will set faster in summer than winter. Keep an eye on the curd during summer. If it is outside for long, the curd may turn sour. For a cup of milk, I use 1.5 teaspoons of curd. 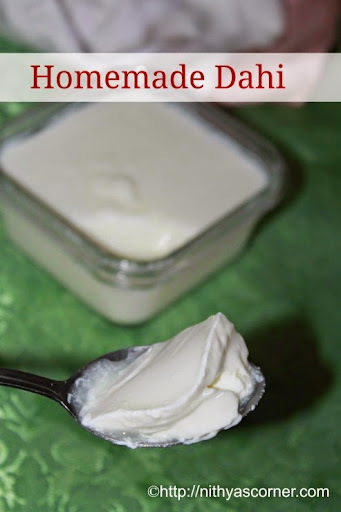 If you are making a large batch of curd, increase the quantity of curd proportionately. Always add fresh and thick curd (fresh culture) to the milk. 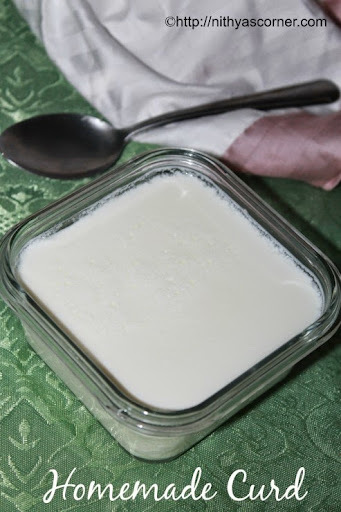 When you add fresh curd to the milk, the curd should be at room temperature. If your curd is watery and gooey, then it means the temperature of the milk was not correct or the fresh curd (culture) was not enough. The milk would have been too hot or too cold. You can reserve a teaspoon of curd when you make a batch of curd and use it next time when you make curd again. Refrigerate the curd once it is set up. 1. Why did my curd not set properly? Your milk might have been too hot or cold at the time of adding curd/culture. Your quantity of curd/culture was not enough. 2. Why is my curd half-set (half of it is curd and the other half is milk)? 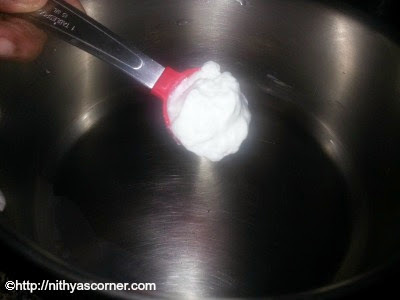 Once you add the curd, you should stir well such that curd and milk are blended well. Curd should mix with the milk uniformly. 3. Can I use sour curd as a culture instead of fresh one? Always use fresh curd. Whenever you make a batch of curd, reserve a teaspoon of curd for the next batch. You can either freeze or refrigerate the culture. One of my friends freezes it for 2 months and when she comes back, she will make a new batch of curd with the frozen culture. If you are using the frozen culture, let it come to the room temperature, and then add it to the lukewarm milk. If you use sour curd, your new batch of curd will turn sour quickly. 4. Even after 5 to 6 hours, my curd has not yet set, what should I do? Place the curd in a vessel of hot water and leave it aside for another 1.5 hours. If the curd does not set, then somewhere something has gone wrong. Do not worry. You will get it by practice and experience. 5. My curd is little watery. What should I do? Try refrigerating it for 2-3 hours. 6. I live in a cold place. I see my curd is taking a long time to set up. 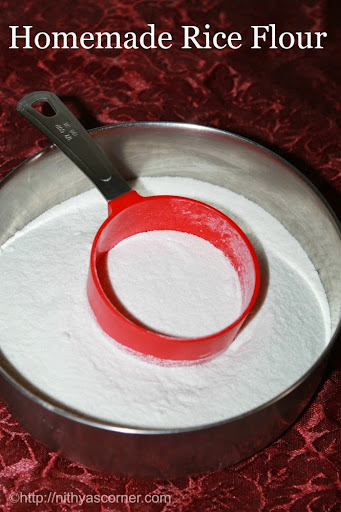 For a cup of milk, instead of adding 2 teaspoons of curd, add 3.5 teaspoons of curd. Also place the curd in a vessel of hot water and leave it aside for it to set. You can also preheat the oven for just 2 minutes at 350F/180C. Switch off the oven. Keep the oven lights on and place the curd container inside the oven for 7 hours or let it stay overnight. 7. By mistake, I allowed the milk to cool down completely. What should I do now? Its okay. Just heat the milk up and when it is lukewarm, add the curd culture. 8. When I boil milk, the bottom of my pan gets burnt and the milk has burnt flavor? Keep stirring the milk on and off. or else use a non-stick pan. 9. Can I use the same container that I boiled milk to set up curd? 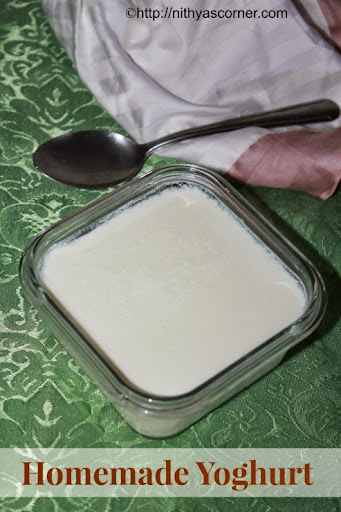 Do not make curd in the same container that you boiled milk. Set the curd in a different container. 10. Can I remove the cream that is formed on the milk? It is your choice. With the cream, you will get a thick and creamy curd. This entry was posted in How to and tagged curd rice, microwave oven, thick curd on November 22, 2014 by vikashbhardwaz.